Hey guys, NewbieDM here…. As you may know, I love showcasing what readers of the site do in their own games, and often provide a space here for tutorials and other things that DM’s may find useful. This article, by Scott Harris, caught my eye when he first proposed it to me. Aerial combat is one of those things that can get a little confusing or hard to represent at the table, so when Scott pitched me the idea of a tutorial for making stands to represent height I told him to go for it. So here now is the tutorial, I hope you enjoy it, and keep those great pitches for articles coming, you never know when yours might get published. When it comes to aerial combat in D&D (or any other game with the option for flying charactes/creatures), I’ve never found a gaming aid that offers the options I truly wanted. There are different aerial combat aids out there, but they are either too limited or too expensive (or both). In particular, the aids I’ve found fall short in simulating the relative altitudes of miniatures in combat. For example, if my character is 60′ off the ground (in the gaming scale), then I want the miniature to actually be 12″ off the table (i.e. assuming a 1″ = 5′ scale). Since I was unable to find a stand that offers the features I wanted, I decided to build my own. Below are instructions on how I did it. For lack of a better name, I’m calling this aid the Aerial Combat Stand or ACS for short. The ACS is very inexpensive and easy to assemble. The stand itself can be built in about 15-20 minutes (assuming you have all of the supplies on hand). Other “add-ons” take a little more time, but are still inexpensive, easy to make, and worth the extra effort. In order to build the ACS, you will need the following materials. * Optional. Used for larger miniature platforms. 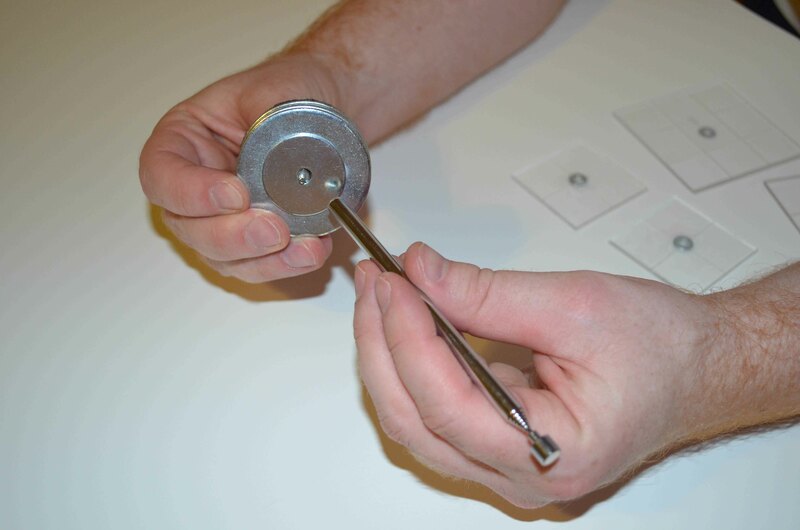 The most important part of the ACS is the telescoping magnetic pick-up tool. This is one of those handy tools that’s used for picking up small metallic materials (e.g. nuts, bolts, washers, etc.) that have fallen into hard to reach places. The telescoping nature of this tool is what allows your miniatures to be at different altitudes. The magnetic tip is also useful for holding larger miniatures (more on that later). For the ACS, you want one of the silver/chrome pick-up tools that does NOT have a fancy handle. Also, it MUST have a screw at the end opposite the magnet. 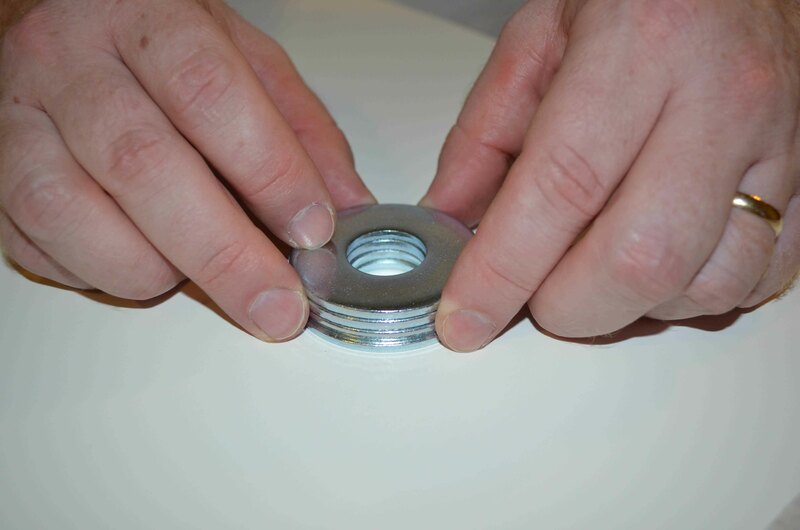 The end screw is crucial for attaching the pick-up tool to the washer base we will be building. Luckily, the type of pick-up tool that’s ideal for the ACS is also the one that’s the least expensive. I got lucky and found some very inexpensive ($1.50 USD) generic pick-up tools in the automotive section at Sears. Sears also offers a Craftsmen version ($4.99 USD) that works well, but it has the Craftsmen logo on it, which (if you’re finicky, like me) takes a little away from the mystique of the game setting. Another version of pick-up tools that is hard to find, but adds a nice effect, is where the magnetic head is on a swivel. The swiveled magnets allow your flying miniatures to appear as though they are banking/turning in flight. It gives the whole thing a little extra added realism. The down side being that they will likely cost more. If you find one of these and want to pay the extra money, then be sure the swivel is strong enough to hold your larger/heavier miniatures. 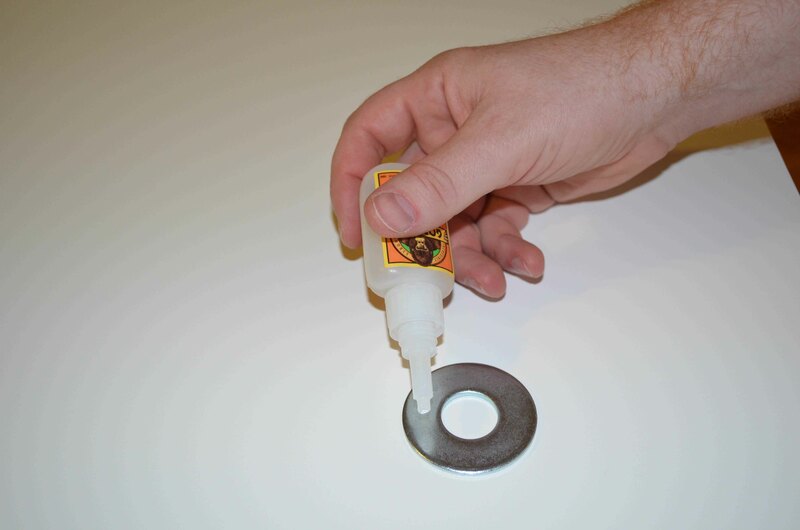 Another important material is the type of glue you use for building the washer base. I suggest Gorilla Glue because it provides a strong bond, is easy to work with, and sets up quickly (i.e. 10-ish seconds). If you can’t find that, then any super glue that works with metal will probably be fine. Also, if you can find super glue that dries clear (and works with metal), then that’s the best option. Don’t bother with the fancy metal epoxies (e.g. steel reinforced epoxy). Those are a little cumbersome to work with and overkill for this project. Flip the felt over so that the paper backing is facing up. 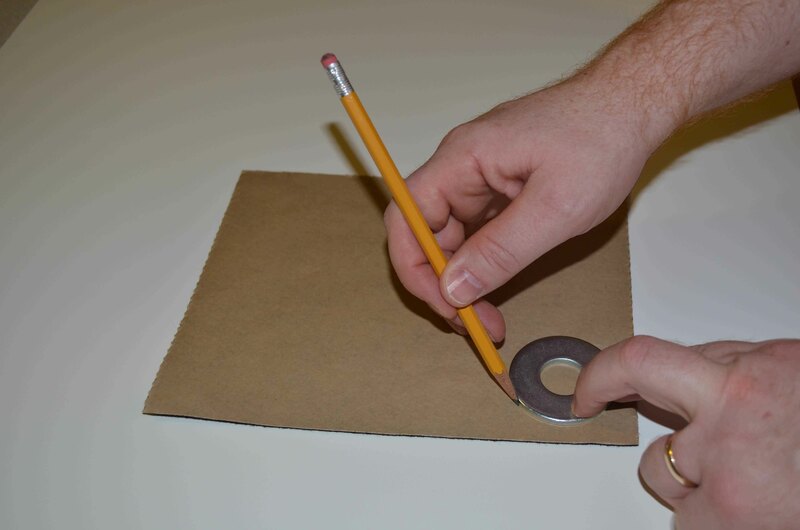 Place one of the 3/4″ cut washers on the felt, and trace an outline around it with a pencil. With a sharp pair of scissors, cut the felt along the lines you traced. You will want to cut the inner circle of the washer out as well. Once you are done, the piece of felt you cut out will look like the letter “O” (or a flat donut). Set this aside. You will need it in Step #3. Do NOT peel off the felt adhesive backing, yet. Since you will be using the super glue for this step, you will want to be sure it is done in a spot where stray drops of glue will not cause a problem. I would recommend a work bench, but if you don’t have one of those, then make sure you put some newspaper down on your table, just in case. dots of glue (rather than a constant beed). Five or six dots between each washer should be enough. to the other three. Let that sit for about 30 seconds. hands so take your time. 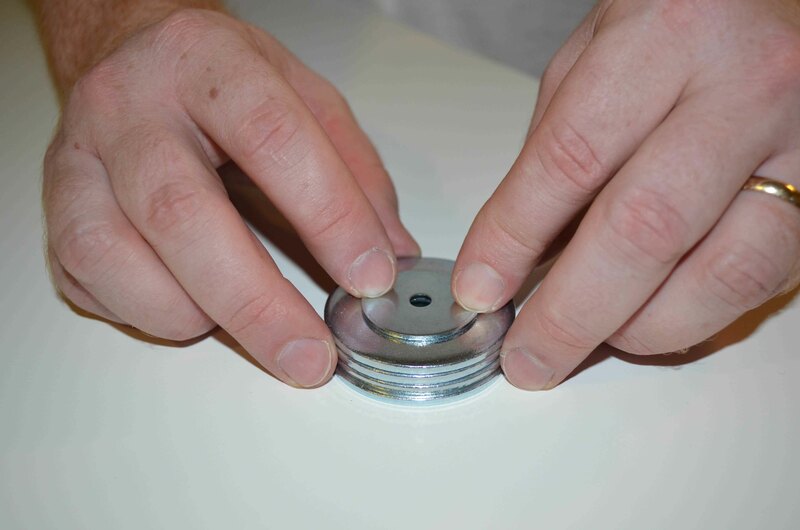 Be sure that the hole in the middle of the fender washer is centered in the middle of the four washer base you have already assembled. Once all of the washers are glued together, let them sit for a few minutes to make sure the glue is dry. Each side of the washers is a little different. There is a flat side and a slightly rounded side. In order for the washers to stack nicely, make sure the flat side is facing down (i.e. the rounded side up) prior to gluing them together. When working with any type of super glue, it is almost inevitable that you are going to get some on your fingers. I have found that the dispensing tip of Gorilla Glue minimizes this issue, but it does not totally eliminate it. When you get super glue on your fingers, let it dry, and then use an emory board (a.k.a. finger nail file) or fine grade sand paper to rub it off. It works remarkably well. place the washer base on top of it. If any of the felt is hanging over the edge, then you can trim it off with a pair of sharp scissors. the small hole of the fender washer. Jiggle it around until it falls into place. 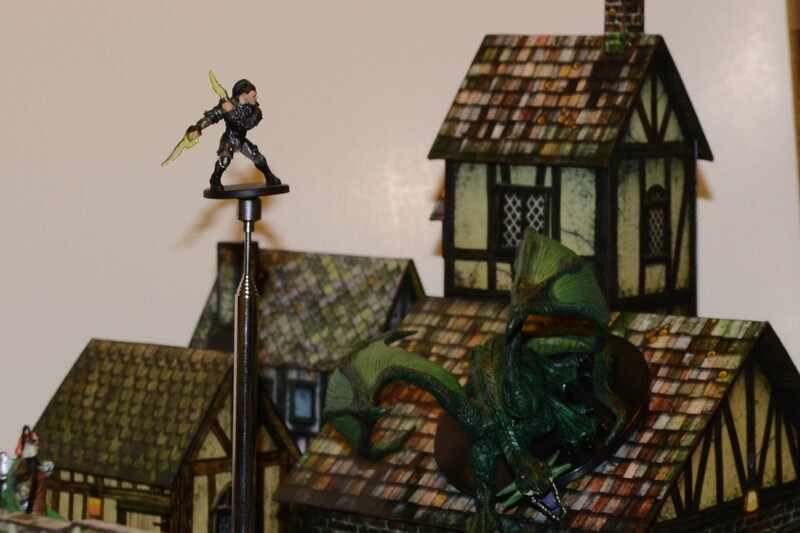 to have larger miniatures flying about your gaming table, then read on to learn how to build the Miniature Platform. The platform is intended for larger miniatures or for situations when multiple small miniatures are at the same altitude and/or next to each other (e.g. locked in combat). Essentially, it is just a bit of clear acrylic cut to size (e.g. 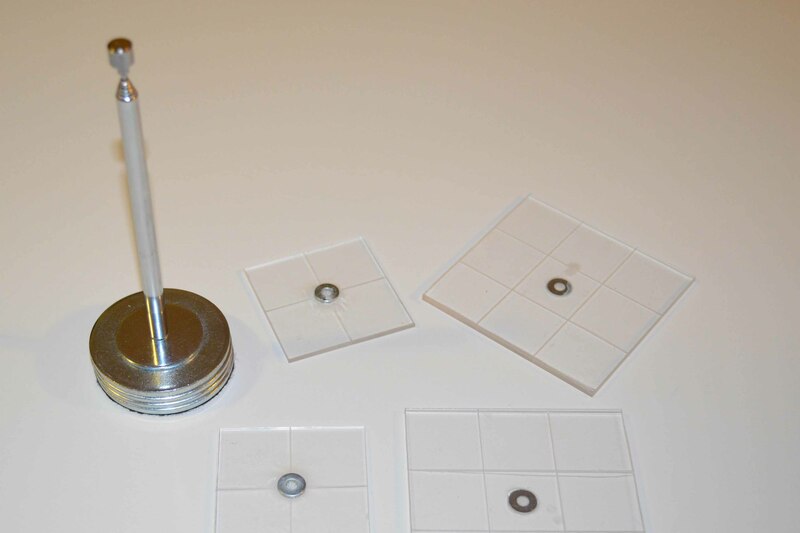 2×2″ or 3×3″) with a small washer glued to the bottom so that it will stick to the magnet on the telescoping pick-up tool on the base we’ve already built. sheets. If you get a 10×12″ sheet (or something about that size), then you’ll have plenty to work with. Cutting the acrylic is the most difficult part of building the platform. If you’ve never cut acrylic before, then you’ll probably want to practice a few times, and don’t worry if you make a mistake or two. You will also want to do this at a sturdy work bench and NOT your kitchen table. You will not really be “cutting” the acrylic. Rather, you’ll be scoring it multiple times, and then snapping off the piece you want. To begin, measure out the dimensions of the platform you want. I created a few 2×2″ platforms and a few 3×3″ platforms. Those should be large enough for most miniatures, and anything bigger will not be stable when it is attached to the combat stand. free hand. Also, you’ll want to use a straight edge to make sure your scoring is straight. I recommend a metal straight edge, because you might end up cutting into a wooden one with your plexiglass cutter. When scoring the acrylic, start with several light to medium strokes. This will make it easier to ensure the score line is straight. Essentially, you are creating a shallow groove in the acrylic. Once you’ve got a good groove started, you can make five or six firm cuts along the groove. You will need to press down very hard. With these multiple cuts, you will likely be about half-way through the acrylic. Once you are there, you are ready for the last step of the cutting process. in case stray pieces go flying. 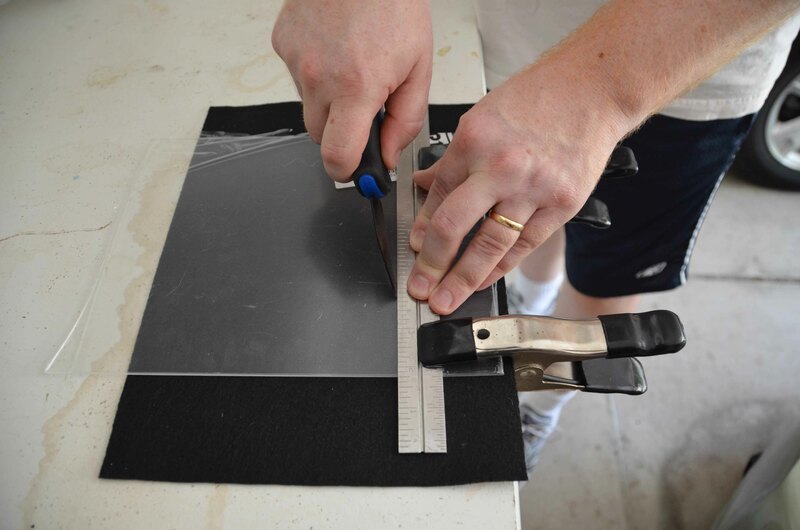 Also, you may have some sharp edges and corners on the cut acrylic, so use a file or sand paper to grind those down. whatever makes sense for the game system you will be using the platforms for. don’t want to do more than one or two firm cuts, because we won’t actually be snapping the piece like before. Create as many grid lines as are necessary for the size of your platform. On the same side of the platform as you added the grid lines, we will now be gluing the small #6 washer to the center of the platform. Once the platform is finished, this washer serves as the mechanism for attaching the platform to the magnetic tip of the telescoping pick-up tool on the ACS base. 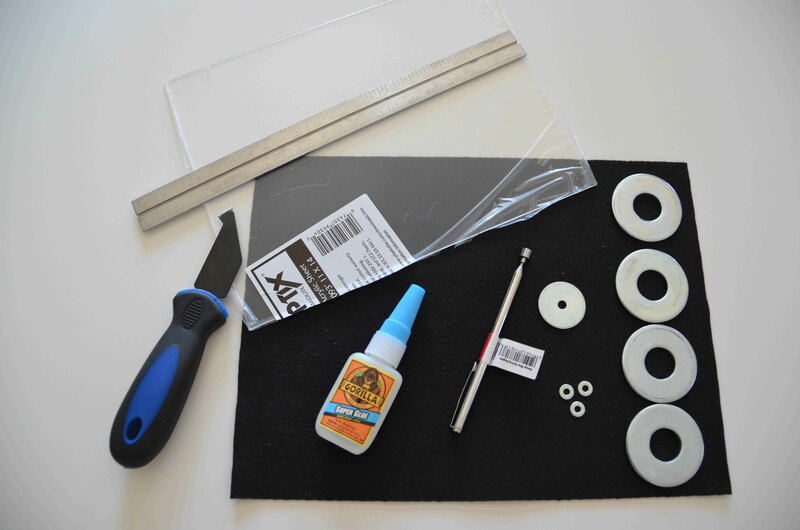 When gluing the washers onto the acrylic, you will want to use a little extra care to avoid using too much glue. I’ve found that some super glues cause a slight discoloration of the acrylic, and if you accidentally get some glue on other areas of the acrylic then it won’t look quite as nice. Once the glue dries, you are all set to have your miniatures fly across your game table. The Aerial Combat Stand works pretty well, but it is not perfect. I have found the following weaknesses with the stands. starts at a higher altitude (e.g. 100′, 200′, etc.). Presumably, this would only become an issue if you had multiple stands in use during some sort of aerial battle. chipping when the bases from multiple stands bumped into each other (e.g. when transporting them). I didn’t care for that, so I removed the paint and decided that painting the stands was not worth the extra effort. you can use a ruler, tape measure, or the grid map you are using in your game. The Aerial Combat Stands offers a realistic option for your aerial encounters. 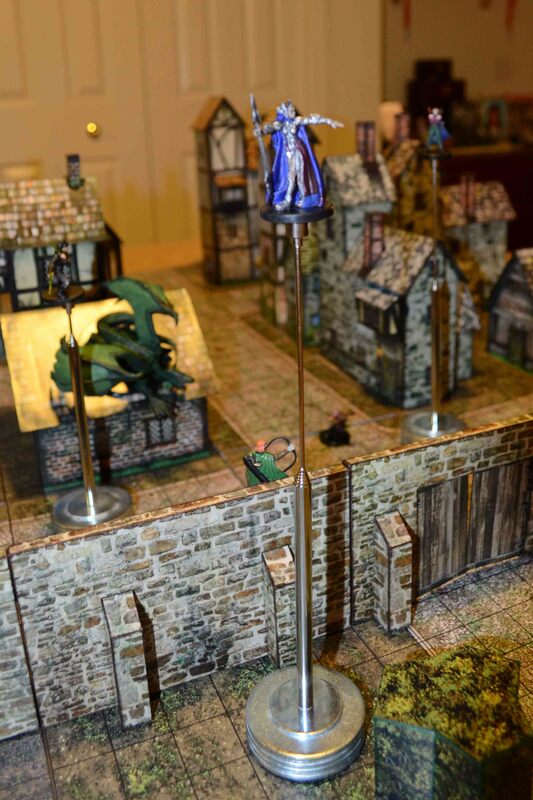 It allows you to have flying miniatures at altitudes that correlate with your gaming table. The ACS is easy to use, easy to assemble, and easy on the pocket book. I hope this tutorial makes your game day a little bit more enjoyable. P.S. 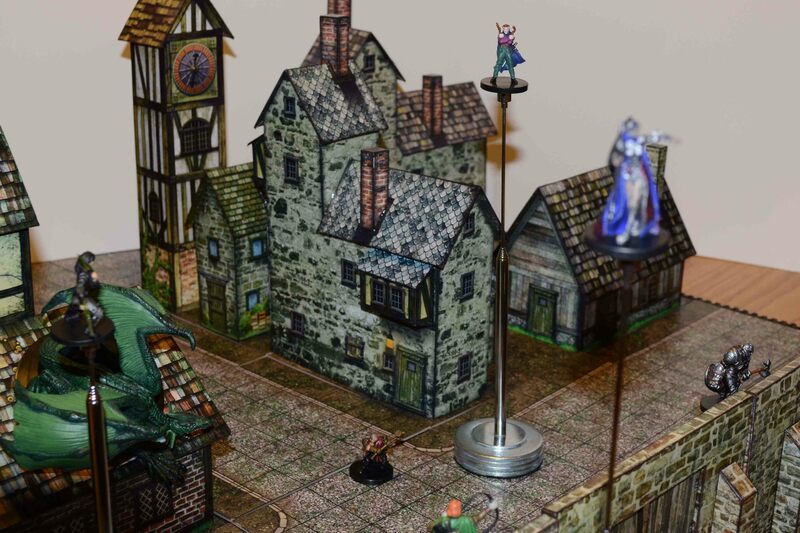 The artwork for the cool cardstock buildings, castle walls, and roads in the pictures above were created by Dave Graffam of Dave Graffam Models (davesgames.net). I encourage you to check out his site. He has some truly awesome products. P.P.S. 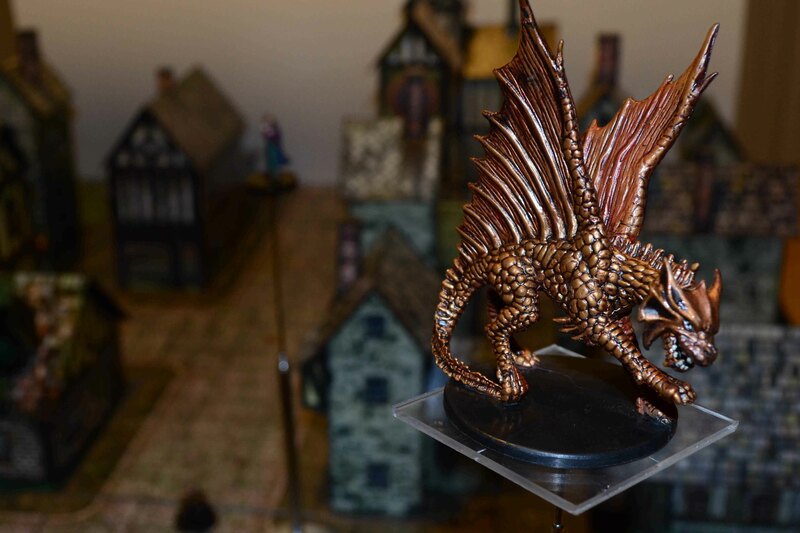 The dragon miniatures were supplied by one of my gaming buddies. Thanks Adam! That’s pretty cool. I’ve seen a few ideas for stands for flying minis but never so easily adjustable ones. This would also be great for adding that elusive third dimension for space battles in sci-fi rpgs. As I’ve said on Twitter, we need more DIY gaming prop articles. This was awesome. Whoa, that’s awesome. I need some of these. I saw something like this is use by airplane dogfighting miniatures gamers at origins a few years back. I’ve been thinking about trying something like this since, so thanks for the tutorial to save me the trial and error! I think Scott Harris is a genius. I can only imagine how cool his gaming sessions must be. But a quick question? In the photo of you tracing the washer, are you giving me the middle finger? Nice use of your antenna. I noticed that you are married. All the good gamer guys are always taken! What is all the other stuff (houses, floor etc) made from? To answer Ozreth’s question, the buildings, castle walls, and ground tiles are made from cardstock. The artwork comes from PDFs that I purchased from Dave Graffam Games (http://www.davesgames.net). The shrubs (which are hard to see in most pictures and also made from cardstock) come from Fat Dragon Games (http://www.fatdragongames.com). I assembled all of the cardstock structures myself. I had used a similar system in my first 3d combat scenario and it worked fairly well. However the big problem we ran into was with multiple miniature above or below each other. I eventually carved a scaffolding like structure out of plexiglass and it worked really well. In fact it worked so well many of my fellow gamers wanted me to make them one, but instead of hand carving 8 of these things I turned to laser cutters. The results were perfect. I have just followed your guide and made 3 of them with lots of interchangeable plinths. Very happy with results.